Please make note of the following important TERMS & CONDITIONS when booking with Hair I Come. Please read the User Terms carefully as they are a legal document, and upon your booking with Hair I Come you agree to be bound by these User Terms. It is the responsibility of the client who books to understand, agree and be responsible for all booking conditions including all payments and are made by specified dates. Our usual service hours are 7 days by appointment 6.00am – 5.00pm. 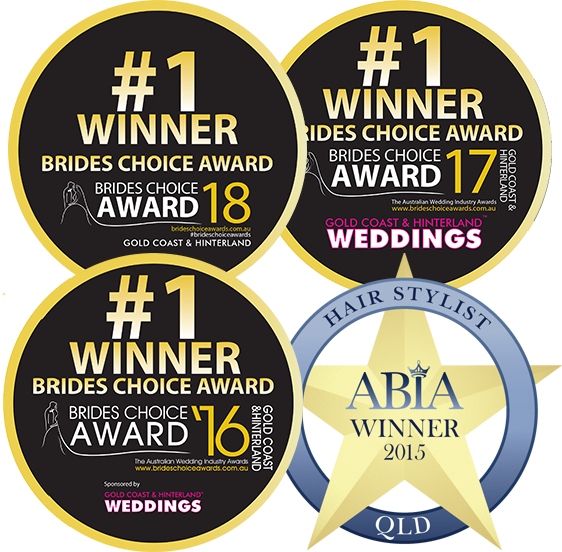 Bookings are subject to availability – please contact Melissa via melissa@hairicome.com.au to confirm her availability. When booking, you will be required to pay a non-refundable deposit, which will under no circumstances be redeemable and transferable. However, if upon availability, you reschedule, it will be transferred to your new appointment within a 6mth time frame. A minimum of 5 adults must be booked in for hair services for Friday, Saturday and Sunday bookings. A minimum of 5 adults must be booked in for Makeup services for Friday, Saturday and Sunday bookings. Wedding dates are not held under any circumstance without the non-refundable & transferable deposit which is deducted from your total invoice amount. Wedding quotes are valid for 1 month. The minimum numbers for hair & makeup need to be confirmed and final, at the time of securing your deposit. These numbers will remain the minimum and cannot be reduced. This will be the number that is payable on the final invoice. It is acceptable to add more people and/or services if it is possible for the artist to achieve or another stylist is able to be acquired. The Outstanding balance of your final invoice must be paid 14 days (or earlier) prior to your event day. All location work is subject to a minimum $30 Mobile Service Fee per stylist. Additional travel fee may apply depending on the distance required to travel. In the event that any hotel/motel and parking fees are incurred as a result of the location of the appointment, these will be passed on to the client/bride. Early Morning service bookings that require us to start prior to 6am surcharge may be subject to a once only fee of $80. Special considerations may be made for commercial or very large bookings. Clients are required to pay the full amount for the trial by Direct Deposit Transfer or Cash. Trial appointments consist of 1 x hairstyling or 1 x Makeup application only, any additional styling may incur additional charges. All trials will be held at either our Makeup or Hair studios. If you require us to travel to you for your trial a travel fee will be charged. The time allotted to a trial is 1.5 hours for hairstyling or makeup. 3 hours for both hair and makeup. If you require two styles to be trialled an additional fee of $100 will be charged. Please let us know before you leave your trial, any feedback you may have. If there are any issues, anything that needs to be changed or fixed, your stylist can address this immediately to ensure your 100% satisfaction for the day. The client scheduling the booking will be responsible for full payment of all services in the event that other people in the wedding party/group do not pay their portion. For all wedding/group hair and makeup bookings the full remaining balance is due 14 days ahead of your booking date. All other small appointments such an event, formal, trial sessions are due 7 days prior. Appointments are only tentatively held for 48hrs from the time and date the invoice was issued. After this the appointment may be voided if a deposit has not been received by Hair I Come and offered to another interested party without prior notice. If you are having difficulty viewing, receiving or paying an invoice, please contact Hair I Come immediately. We recommended that able clients send a transaction receipt as proof of payment. Hair I Come accepts Direct Deposit Transfers, (Cash,) for methods of payment. Please use your booking date & name and as a reference when making a Direct Deposit Transfer. All wedding deposits and payments are non-refundable. Wedding bookings are to be paid via bank deposit no later than 2 weeks prior to the event. All other small appointments such an event, formal, trial sessions are to be paid via bank deposit no later than 1 week prior to the event. Please Note: If you wish to have a trial before you secure your deposit, this is fine. However, even if you have made an appointment for a trial, your date is still not secure without a deposit. If another person pays a deposit for the same date, we will certainly let you know immediately that this date is no longer available. Once you have had a trial, we only hold the date for 24hrs until it is released again. Please note that all prices are subject to change without any notice. All invoices issued to clients already booked in before a price increase occurs, will not be affected. If there are any additional services provided on the day, cash payment will be required. This is payable upfront before the stylist starts. Additional services include hairstyle changes, longer/thicker hair than what was quoted or parking fees etc., or anything that was not included in the final invoice. It is recommended to give Hair I Come notice if others in attendance want styling so arrangements can be made. Hair I Come recommends that numbers for styling are confirmed in advance to avoid potential disappointment where we may not be able to cater to extras. Please confirm your numbers at the time of booking as we don’t offer any reductions at any time for hair and makeup services. Should someone in your wedding/group booking cancel at any time they are welcome to be replaced with someone else, e.g. a guest or relative. You will be charged the full amount of the service since the booking duration on the requested date has been specifically allocated to you which results in lost earnings/bookings for us. It is your responsibility as the client to communicate and make the other parties aware of our rates and terms of service. Cancellations without the above-mentioned prior notice will be charged the full cost of the booking. All deposits and payments are strictly non-refundable and non-transferrable. This also applies to weddings that have been cancelled due to personal relationship or personal financial problems. Cancellation of any booking by you must be communicated in writing, by post or email and will only be confirmed upon receipt of this. The complete deposit will be retained by us regardless of notice given due to administration and loss of other bookings caused by allocating your appointment. Due to the potential loss of other bookings whilst your wedding date has been held for you, the cancellation of any wedding day booking must be given in writing, by post or email and will only be confirmed upon receipt of this. The following cancellation fees apply if the booking is cancelled by you. Hair I Come does not offer refunds for any completed services; therefore, if you are in any way dissatisfied, the client should notify the stylist whilst they are on location. The deposit is strictly non-refundable and non-transferrable. There are no refunds of any payments paid toward any bookings where there has been any partial/full cancellation made within the three-month period leading up to the booking/wedding date. If we have contacted you via the contact details you have provided, at any time throughout your booking and you do not reply within 7 days, we will assume that you do not wish to maintain your booking with us and will therefore make your date available to other enquiries again. Time management is of the essence therefore adherence to booking times is critical in ensuring that Hair I Come delivers the service you expect and will be strictly adhered to. Should unforeseen circumstances arise, the onus is on the bride/client to advise Hair I Come as soon as practical. Hair I Come is not responsible if desired completion time is not met due to client/group/wedding party delays. Hair I Come will notify the client of their arrival time prior to the booking. If you have a particular schedule, please advise this at the time of booking or as soon as possible so we can take this into account when allocating our bookings. Hair I Come artists timing varies depending on the individual artist, the service required and technical individual requirements of the client. Makeup Artists and Hair Stylists are roughly 75min for brides and 60min for all others. Any service bookings that require us to start outside of our service hours may be subject to a once only fee of $50. Special considerations may be made for commercial or very large bookings. Junior makeups that have been offered on a complimentary basis are for girls aged 10 years or younger and only include face moisturize, eye shimmer, powder blush and lip balm/gloss application only. Age appropriate makeup is for girls aged 15 years or younger and includes light foundation and concealing, blush, mascara, light eye shadow, highlighter and lip gloss only. Any other required applications will be charged for. Full makeup includes the usual applications to the face area and neck. Any other required applications will be charged for and quoted prior to application. Additional requests such as glitters, specialty lashes, gemstones, bold/unusual pigments and other special mediums need to be requested in advance which we will quote for. We do not carry specialty items unless requested. Please provide notice so arrangements can be made. Should tattoo coverage be required please advise Hair I Come in advance so this can be discussed for time and cost to be quoted. Hair I Come is not, under any circumstances, responsible for any allergic reactions to products used. The onus is on the client to give advance notification to Hair I Come if you or any of your group/wedding party have particular hypersensitivity that you are aware of. Should you bring your own product that you are familiar with, then Hair I Come would be happy to use the product. We cannot make guarantees surrounding quality for product(s) you supply for us to use. Melissa & other hairstylists & makeup artists working for Hair I Come, reserve the right to refuse service on anyone displaying skin liaisons, cold sores, eye infections, head lice or someone who has fresh cuts & bruising from any facial or neck surgery. Hair I Come artists reserve the right to refuse service on any clients displaying contagious viral symptoms including but not limited to vomiting, diarrhoea and suspicious rash to ensure health of our staff and our other clients. Children in presence of the booking are to be supervised by a responsible adult at all times. Children are not to be in the service area at any time unless they are having a service and are being supervised by a responsible adult. This is for their own safety; we use very hot styling tools, operate electrical equipment and have very heavy equipment which can tip if not used correctly. Hair I Come accepts no liability from any claims arising from any children’s injury while in the service area. In the event that the original scheduled Hair I Come artist(s) are not able to attend the appointment to provide hair and/or makeup services on the scheduled booking date, Hair I Come will make every attempt to replace the hair and/or makeup artist(s). However, if we are unsuccessful, the limit of liability is a full refund of all monies already paid for the hair and/or makeup for the affected date only. Clients acknowledge that Hair I Come may use any video/photographs or images taken for portfolio, website, social media and any promotions. The contents and advice on this site are for general informational purposes only and should not be substituted for seeking the advice of a medical professional. We accept no liability for any claims arising out of the misuse, allergic reactions, or any injury suffered from the consenting use of the products and equipment offered by Hair I Come. By making a booking with us you acknowledge and accept this policy and release us from any liability if such a situation should arise. The client understands that once they pay the booking deposit, they are legally bound by this document. I acknowledge that Hair I Come may use my photographs, videos or images for portfolio, website, social media and any promotions. I confirm that I have read and understood the information provided and agree to Hair I Come terms and conditions. I understand that once I pay the booking deposit, I am legally bound by this document.